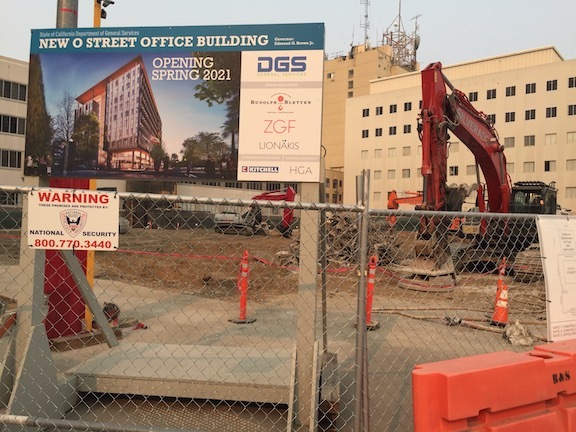 The state is building several new office buildings downtown. Close to where I live, the former building at O St and 12th is gone, and will be replaced with a modern office building, and the block between O and P and 7th and 8th is seeing a new building. There are others planned, and there is a plethora of state-owned surface parking lots (a travesty of land use if ever there was one) that could be developed. It is good, in a sense, to see the state aggregating scattered offices into more centralized locations. But what is not good is that the state is not building any housing to go with the offices. So most employees will still be driving in from the suburbs, creating air pollution and rush hour congestion in the process, while contributing nothing to life in the central city. Almost every new building, whether public or private, has some retail, at least a corner and sometimes the whole ground floor. But integrated housing and office is rare. So, my modest proposal (in the Swiftian sense) is that every office building of one-quarter block or larger include housing for at least one-quarter of the employees of the building. Not just the daytime office drones, but the maintenance staff as well. Some percentage should be required affordable, probably 20% to cover the lower income maintenance and clerical staff. I am not saying the the residences should be limited to employees of the building, I’d leave it up to each building manager how they wanted to allocate housing. I have mixed feelings about whether this should be required of private developments. Certainly there should be codes and city support for accomplishing the same objective in private development, but requirements, not so sure. But state owned buildings, yes, absolutely, every one of them. I lived in midtown, close to the downtown boarder, for seven years, and have now lived in downtown, near the midtown border, for just under a year. I moved all of five blocks. These two places might as well be in different cities. Downtown is dead, dead, dead at night and on weekends, whereas midtown is alive weekdays, evenings, and weekends. The difference? I think it is primarily the lack of housing in downtown. Office towers do not make for a livable, walkable place.